The Sitges International Fantastic Film Festival is proud to announce the World Premiere of one of the year’s most anticipated horror shorts "GOODNIGHT, GRACIE,: written and directed by Stellan Kendrick, produced by Kendrick & Gloria Sandoval, and executive produced by Graham Wetterhahn, all UCLA graduates. The film stars 8-year-old Caige Coulter as Gracie and Courtney Gains (CHILDREN OF THE CORN, THE ‘BURBS) as Billy the killer. In "GOODNIGHT, GRACIE" a mother gets hacked to pieces by her latest lover, Billy, while her devout child daughter, Gracie, fights to escape the same fate. 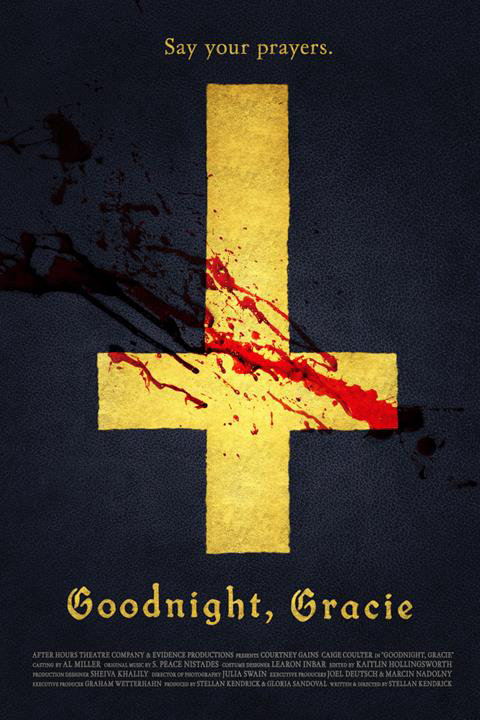 Inspired by the director’s real life divorce of his parents, "GOODNIGHT, GRACIE" proclaims the thematic resonance of “blind faith leads to death” through the power of horror clichés and suspenseful storytelling. “'Goodnight, Gracie' is a proof-of-concept for our crew. We’re looking to further develop our team as we work toward a feature film. We have several horror projects in development,” producer Gloria Sandoval said. The film that American genre blog, Horror Fuel, calls a “living nightmare” has also been selected at other film festivals already, and still counting. Following its World Premiere at Sitges, "GOODNIGHT, GRACIE" will be the Opening Night film at the San Antonio Horrific Film Festival in Texas (October 20). It will then be presented at the NYC Horror Film Festival (October 29). Please check the film’s site and social media for updates. Starring Caige Coulter as Gracie, Courtney Gains as Billy, Zoë Simpson Dean as Mom and Brad Goodman as Dad, "GOODNIGHT, GRACIE" is written and directed by Stellan Kendrick, produced by Stellan Kendrick & Gloria Sandoval. Lead Executive Producer: Graham Wetterhahn. Executive Producers: Joel Deutsch & Marcin Nadolny. Director of photography: Julia Swain. Production Designer: Sheiva Khalily. Edited by Kaitlin Hollingsworth. Casting by Al Miller. Costumes designed by Learon Inbar. Original music by S. Peace Nistades. Visual Effects provided by Aureate Films under the supervision of Kristopher Wile. Originally from San Diego, director Stellan Kendrick moved to Los Angeles to attend UCLA where he graduated with a degree in history and film. He worked at ICM Partners before joining Chatrone LLC, where he’s currently a literary manager. He has collaborated with Disney, Fox, and Nickelodeon as well as networks and studios around the world. His previous film "STRING!" played at film festivals internationally.